There are two reasons Turkish Prime Minister Recep Tayyip Erdogan may not survive the current government corruption scandals in Turkey. And if he does, the cost to the “Turkish model” will be enormous. The first is, well, the corruption charges. An important key to the success of the AK, or Justice and Development, Party that Erdogan helped to create in 2001 lay in its initials: AK means “white” in Turkish, and it can also mean “pure.” Turks were sick of the unaccountable corruption of previous governments. The AK Party rode a promise of purity to power. Suddenly, the AK Party is looking decidedly grubby. Yes, the 89 people who have been detained so far in the corruption and money-laundering probe are all innocent until proven otherwise. And yes, the prosecutors in charge are the same ones who based the so-called Sledgehammer trial against the military on forged documents. Still, the three simultaneous cases that have been initiated, as outlined in the news media, are damaging. One case, for example, involves about $70 million worth of alleged bribes connected to an Azerbaijani businessman, who is accused of running cash into Russia and trading gold into Iran and is now under arrest. Police found $4.5 million stuffed into shoe boxes at the home of another suspect, Suleyman Aslan, the general manager of state-run Turkiye Halk Bankasi AS. That’s a lot of money even for Jimmy Choos. This is the same bank that was the focus of a May 14 letter, signed by 47 U.S. congressmen, complaining about its gold-swap financing of trade with Iran. So far, no cabinet ministers have been arrested, but the sons of three have been detained. According to the latest Turkish news media reports, prosecutors have asked parliament to lift the immunity that was granted to their fathers as well as a fourth minister. All of this makes Erdogan vulnerable. He was already weakened because the coalition of religious conservatives, nationalists and liberals he had built since 2001 had disintegrated by the end of this summer’s Gezi Park protests. Now he is also at war with former close allies among his religious conservative base, a group led by faith leader Fetullah Gulen. Precisely because Erdogan has concentrated power so closely around himself in just a few men, any perception that they are corrupt will immediately infect his personal image and support. This is why Erdogan hasn’t fired the four ministers: He says the allegations against them are part of a plot to unseat him. My guess is that he’s right, but his response gets to the second reason Erdogan may not survive, despite being far stronger than Gulen: himself. Erdogan is an extraordinary politician, one of the most intuitive I have met. 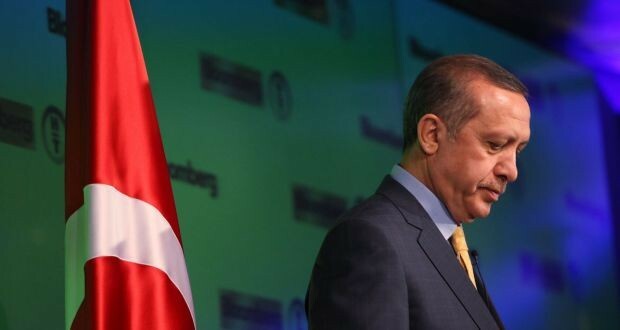 Yet since the AK Party’s third thumping election victory in 2011, when he declared his “master period” to be at hand, Erdogan appears to have lost the political compass that once told him when to be pragmatic and cut his losses. His fight-or-flight response now includes only one — to fight. In response to the allegations, Erdogan has fired dozens of Istanbul police chiefs involved in the arrests, the same ones he defended and praised over their handling of the Gezi Park protests earlier this year. He says the corruption cases are part of the same plot he detected behind the Gezi Park protests, conducted by the same dark morass of international conspirators. Except that now the police who cracked down on the protesters must be part of the conspiracy, too. This is just untenable. To make it stick and purge Gulen’s supporters from the police force, prosecutor’s office and courts, Erdogan will have to crack down in ways that will destroy what remains of Turkey’s independent law enforcement institutions and media freedoms. That will deal a huge blow to the so-called Turkish model, the idea that Turkey had cracked the code for implementing genuine democracy in the Muslim world. And that would be a tragedy, because the Turkish model is real and important, if overhyped, oversimplified and already under strain. Zafer Caglayan, the economy minister who has declared himself “allergic to interest rates,” supported Erdogan’s interesting economic theory that high interest rates cause inflation. Interior Minister Muammer Guler is the man who said recently that mixed lodgings at universities should be banned because “terrorist organizations have started to significantly abuse the relationships between the boys and girls, those among the university youth. They use it as a recruitment base.” What can one say? Minister for EU Affairs Egemen Bagis said, memorably, during the Gezi Park protests earlier this year that “Everyone who enters Taksim Square will be treated like a terrorist.” He is a reliable echo chamber for Erdogan’s latest thoughts, but he’s an unconvincing minister. The sons of the first three ministers on this list have been arrested. While he’s at it, Erdogan should shed his new adviser, Yigit Bulut, who has accused unnamed centers abroad of trying to murder Erdogan via “telekinesis.” I hardly dare imagine what advice he gives. These men were once at best marginal in Turkey’s government, but they have become central, displacing the steadier hands Erdogan used to rely on, such as Deputy Prime Minister Ali Babacan on the economy. Erdogan should make a clean break, removing the four targeted ministers so that they can give their full attention to the corruption investigations. He also needs to give his own full support to those probes, demonstrating that he isn’t protecting himself and remains committed to the original, “pure” promise of the AK Party. I doubt this is what Erdogan will do. He would see it as a defeat, because it would mean sharing power and influence with people who haven’t always said “yes.” He wouldn’t become the all-powerful president he plans to be next year, after the country’s first direct presidential elections. I suspect he will fight back as he knows how, and he may very well win. The Erdogan of a decade ago, who deftly avoided the political traps that the military and its supporters planted for him, would have made a better choice. He wouldn’t have gotten himself into this mess. He would have been listening.